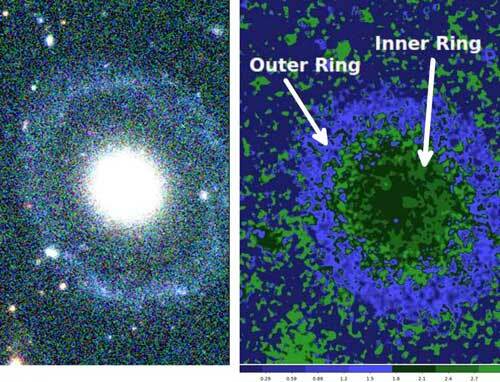 (Nanowerk News) Approximately 359 million light-years away from Earth, there is a galaxy with an innocuous name (PGC 1000714) that doesn't look quite like anything astronomers have observed before. New research (Monthly Notices of the Royal Astronomical Society, "A photometric study of the peculiar and potentially double ringed, nonbarred galaxy: PGC 1000714") provides a first description of a well-defined elliptical-like core surrounded by two circular rings -- a galaxy that appears to belong to a class of rarely observed, Hoag-type galaxies. This work was done by scientists at the University of Minnesota Duluth and the North Carolina Museum of Natural Sciences. Watch a video about this research.